Automatically bends and shears deformed reinforcing steel, #2 (6mm) through #4 (12mm) dual strand and #5 (16mm) single strand. The Bar Form 1016 handles coiled or straight stock with an optional two-plane straightener. 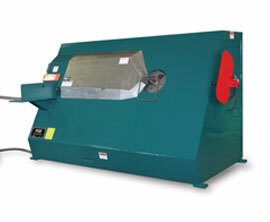 The preloader with its bar puller mechanism eliminates the need for shakeout or whipping of small diameter rebar. The Bar Form 1016 takes much of the "light bending" and shearing from the conventional shearline and table bender, while dramatically reducing your man hours per ton.In certain geographic areas where rebar from coil is at a premium cost, substantial savings can be realized by running straight bar. Eliminate dual inventory costs and gain production, with the Bar Form 1016 B.